Tear off your hair shirt for some good old-fashioned, big-band Bach. If, though, you want to get fully into Metropolitan Hilarion Alfeyev’s Bach party, you may have to don some vestments instead. 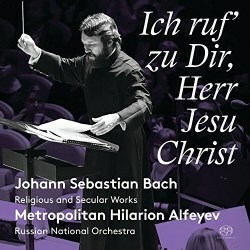 As Alfeyev seems to suggest in his rather pious liner note, it helps to have the God gene to properly appreciate Johann Sebastian’s gift – it’s above all about “spiritual symbolism and spiritual content”, and “music (that is) deeply mystical because it is based on an experience of prayer and ministry to God”. Very little, apparently, to do with indelible melodies, unique harmonies, perfect form, or any of those other absolute, abstract touches of genius that make for great music from anybody, anywhere, at any time. I also detect in Alfeyev's approach to Bach a Brucknerian view that “grandeur and truly symphonic scale” will more likely get the Almighty’s attention. Hmm ... while Bach, by the way, is one of my musical gods, I have a hunch that someone as smart as JSB, if enlightened by today’s knowledge of reality, would see life, the universe, and everything else quite differently. And still compose indestructibly great music. Perhaps adding to the whiff of hubris, Alfeyev is extolled in the publicity blurb as “Russia’s foremost composer”. Really? That’s news to me. My research comes up predominantly with references to him as a bishop of the Russian Orthodox Church, author of many books on theology and, coincidentally, a composer. Such aggrandizement can’t be blamed on Alfeyev, I suppose, but you would expect at least a substantial discography to back it up – there isn’t one. Further, the only recording of his music reviewed on this site was a bit of a stinker, it seems. Amen to that, and for Bach substitute just about every composer of note before or since, as I see the authenticity juggernaut has now reached Ravel. Given his expansive view though, Alfeyev’s choice of centrepiece in this Bach concert may seem a little bizarre. The cantata for baritone solo Ich habe genug (“I have enough”) has humbly minimalist connotations; to then throw the full weight of the Russian National Orchestra behind it is rather to say “I have more than enough, and then some ...”. Here, contrary to Alfeyev’s proselytising about the deeper meanings of Bach’s music, it’s probably better not to know what the music is about (no texts, anyway), and just enjoy it for what you hear. And lovely it is, my only vision being of soloist Stephan Genz in tuxedo floating on a cloud of lush string harmony. Genz has a beautiful voice, if just lacking a little power in its lowest reaches. Plaudits also to the unnamed oboe soloist. Despite his protestation about fast tempos, Alfeyev doesn’t wallow, despatching the work in significantly less time than the classic 1965 account with John Shirley-Quirk and the Academy of St Martin-in-the-Fields under Neville Marriner. Shirley-Quirk, with greater tonal weight and palpable gravitas, gives us the sackcloth-and-ashes version. I can take either. Over to the secular side, the second major work on the disc is the Orchestral Suite No. 2, with the prominent flute part, and here I couldn’t help getting some déjà vu of James Galway in his efforts to popularise classical music. There’s nothing new about big-band Bach for this work, witness Otto Klemperer and Herbert von Karajan for example, but again there’s an élan about the present performance that clearly places it in a more modern context. Alfeyev as before doesn’t hang about, his movement timings on a par with, and overall quicker than, the ‘authentic’ Masaaki Suzuki with the Bach Collegium Japan. And to their credit, Alfeyev and his multitudinous players don’t sound at all rushed, just nicely buoyant. This time the excellent soloist, flautist Alya Vodovozova, is named. If there is a downside, this is not the lithest performance of the Suite you’ll hear, the mass of forces involved militating against the sharpest attack and pointing of detail. Alfeyev’s own orchestrations of two Bach organ works begin and end the programme. The chorale prelude Ich ruf’ zu Dir, Herr Jesu Christ is tastily presented with the voices of trumpet and oboe as toppings on a vanilla string base. With his arrangement of the Passacaglia and Fugue in C minor, however, Alfeyev joins the major league, other members including Leopold Stokowski, Ottorino Respighi, Eugene Ormandy and, yes, Sir Andrew Davis. The first two transcriptions I know well, so how does Alfeyev do? Simply, wow! I’m trying hard not to be overly swayed by the stunning Pentatone recording, which in surround sound is quite overwhelming, but Alfeyev’s is a masterful effort, using the full resources of the orchestra, appropriately, colourfully, and to maximum effect. Very Russian is the prominent use of bells and, paradoxically, the only missing element, I suggest, is an organ. Some subterranean pedal tones underpinning all that glorious noise might have converted me – well, not really, but I think you know what I mean. Whether or not Alfeyev’s transcription gets into the general music literature for this piece, time will tell. Prima facie, it deserves to. Dutifully reading the liner notes possibly set me off on the wrong foot with this review, expecting certainly some explanation of the religious roots of Bach’s music, but not a mini-sermon. I suppose I should have taken a clue from the cover artwork. Using just my ears, though, Metropolitan Hilarion Alfeyev delivers a rich feast which resoundingly conveys the grandeur and beauty of Bach’s music and, for me, its genius and universality. The epiphanies are optional.